If Hari, Waheguru, Lord god does kirapaa karae - blesses us with His Grace, thaa - only then can we meditate upon His name, upon His immortal name. Those people who milai - meet with the sathguru - with True Guru with subhaae - with love, sharda and faith, firm faith and true love they are sehaj gun gaaeeai jeeo - they are colored in the love of peace and poise and they sing the praises, the virtues of Waheguru. By singing the praises of Waheguru they vigasai - they blossom forth, they grow spiritually sadhaa anadhin - for day and night, continually they vigasai - they blossom in this glory. Jaa aap saachae bhaavaee - when it becomes pleasing to the True Lord Himself. They give up ahankaar - ego, houmai - pride, maaeiaa - attachment to this transitory world, this illusion around us. Sehaj naam samaaveae - in this avasthaa - in this state of being of sehaj - of complete balance and poise where one is completely absorbed in the hukam, in the command of God they naam samaveae - they merge into Waheguru jee's naam. Wahegurujee Himself is the karathaa - creator Himself and karae soee - acts Himself as well. He is playwright, the actors and the stage, all in one. Aap dhaee th paaeeai - only if He gives us, blesses us then we find, receive and are blessed. Only when Waheguru jee does kirpaa - blesses us with His Grace thaa naam dhiaaeeai - then we meditate upon the naam. Within the Guru has implanted his saachaa naehu - true love for poorae sathigurai jeeo - my beloved Guru, my True Guru, my sathguru has implanted this within me and I feel this Love towards Him also. I serve the Guru dhin raath - day and night. Mai kadhae n veesarai jeeo - by serving the Guru day and night I never forget Waheguru. I never forget Waheguru. why? Because anadhin samaaree - day and night I meditate on His name again and again, I call out His name day and night. Jaa naam lee thaa jeevaa - when I repeat Waheguru jee's naam - Waheguru jee's name then I find true spiritual life. When I listen to Waheguru jee's praises with my ears th eihu man thripathai - then my mind finds complete peace, thripathai means to be completely satisfied, to be completely satiated, all the fires of ego, greed, anger are put out. Guramukh anmrith peevaa - by facing towards the Guru, by following what the Guru says I drink enjoy the immortal nectar of His name. 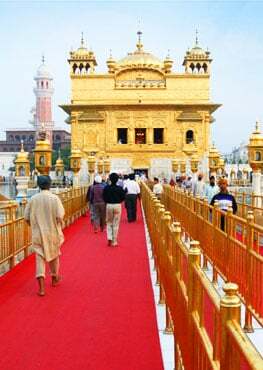 If Waheguru jee blesses me with His Grace thaa sathigur maelae - then He unites me with the True Guru, anadhin - day and night bibaek budh bicharai - the True Guru blesses me with bibaek budh and I bicharai - I come to understand this spiritual wisdom of understanding of what is the path. Inside me there is True Love poorae sathigurai - which is implanted by the True Guru, my beloved Guru. Only those people who have vaddabhaag - great blessed fortunes milai - meet with the satsangat - the company of those who take them towards sath - towards the truth. Then what happens in the company of those who are focused upon the truth? Thaa har ras aaveae jeeo - then we are blessed with har ras - the essence of Waheguru - this ecstasy of God's name comes to dwell within. Day and night they liv laae - they are attached to Waheguru jee's name. Th sehaj samaaveae jeo - if day and night we are attached to Waheguru then we merge into this sehaj avastha - this state of peace and poise. Those people who are in this state of being, being at peace with the hukam - with the command of God and with the naam implanted within them thaa har man bhaavai - then they come to please Waheguru jee, Hari. Sdhaa atheeth bairaagee - forever and ever they live their lives unattached from the world and bairaagee - completely unaffected, unphased by this world. Jag - within this world sobhaa - they are blessed with glory in halath palath - in this world and the next. Raam naam liv laagee - only if their liv - their consciousness remains attached to Waheguru, to raam jee's name, to Waheguru jee's name. They become liberated from harakh sog - from happiness and pain because jo prabh karae s bhaaveae - in this state, Gurujee here is explaining the state of sehaj - whatever Waheguru jee's does they are pleased with it, that is the state of sehaj, of complete poise. Only those people with great fortunes are blessed with the company of those who seek the Truth. Thaa har ras aaveae jeeo - then they are blessed with this nectar of har ras - of the essence of har ras within. Those people who are manmukh - who follow their mind they are attacked by jam - by the messengers of death, the angels of death because dhoojai bhaae dhukh hoe - because they have love for material world, they do not serve Waheguru, they only serve material needs and from this dhukh hoe - pain comes, not just the pains of the messengers of death but also in this world they receive pain. Day and night they live their lives saying haae haae - crying out. Maaeiaa dhukh mohiaa jeeo - they are attached to this illusion, to this world. That is why they have dukh - they have pain. They are in pain because they are attached to this pain and haumai rohiaa - ego within always keeps them rohiaa - always keeps them angry. Maeree maeree karath vihaaveae - their life passes away by shouting our meri meri - this belongs to me, this belongs to me! I am the greatest, I, I, I, me, me, me. We forget what god has given us, we do not remember what god has given us. Waheguru jee has given us this beautiful body, has blessed us with human life. Waheguru sache patshah has blessed us with some sort of attachment to the Guru's bani - the Guru's words yet we forget this day and night. Just as in Sukhmani Sahib on Ang 269 of SGGSjee Guru Arjan Devjee talks about all the things that God has given us and Gurujee begins: jih prasaadh shatheeh anmrith khaahi | this thaakur ko rakh man maahi - that God who gave you everything to eat, jih prasaadh sugandhath than laavehi | this ko simarath param gath paavehi | jih prasaadh basehi sukh mandhar - that God who gave you houses, who gave you everything thisehi dhiaae sadhaa man andhar, remember Him, but we don't! Chaethai naahee anth gaeiaa pashuthaaveae - in the end when we have to leave we repent, we cry out. Without the name of God nothing goes with us. All of the sons and the families and all the money - nothing goes with us. O Waheguru, bless me with Your Grace and laehu milaae - unite me with those who mehal har paaeiaa jeeo - who have found Your mehal, Your presence, who have realized You. Forever and forever may I remain together with my hands pressed together in prayer. Sathguru says this is the way of pleasing prabhu, of pleasing Waheguru. When you please Waheguru then you hukam samaavai - then you merge in with the hukam, you understand the hukam - hukam rajaai chalanaa. The first question in SGGSjee is kiv sacheaaraa hoeeai kiv korari tute paal? How do we become truthful? How do we become one with Waheguru, with sathnaam - kiv korre tute paal? How can the wall of falsehood be broken? Guru Sahibjee says hukam samaavai- please the Lord and you'll merge in with that hukam. The answer to that question is hukam rajaaee chalanaa ta Naanak likhiyaa naal - you'll become part of that hukam. hukam mann sukh paaeiaa - you'll find peace by accepting God's hukam, God's will. Day and night they meditate upon Waheguru and they achieve this state of sehaj - this is where they truly meditate upon Waheguru. By meditating on the naam again and again, by focusing completely on the naam they are blessed with glory. Naanak naam man bhaaveae - Sathguru patshahjee is saying the naam pleases my mind. Waheguru jee please Bless me with Your Grace, unite me with Yourself Waheguru and unite me with those who mehal har paaveae jeeyo - who've found Your presence within all.